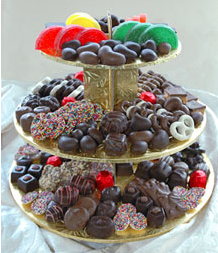 Make your days a little bit sweeter with our scrumptious Gourmet Chocolates and candies. We only carry the finest candy, and it always hits the spot! Visit our Candy Shoppe for a pound of chocolate covered pretzels to munch on at the office or for a gift box of butter creams. You will never give flowers again! We have over 30 varieties of Asher's chocolate covered pretzel varieties including: M&M, Reese's, Snowcaps, Butterfinger and of course plain milk, dark and white chocolate. We also have butters, creams, jellies, peanut smoothie, sea salt & caramel chocolate, boardwalk crunch… and more! Our delicious fruit slice flavors are orange, lemon, lime, cherry, watermelon, pineapple, and raspberry. The yummy gummies are gummi worms, alligators, fruit salad, britecrawlers, swedish fish, licorice wheels, finnish licorice and, of course, gummi bears! Our personalized favor boxes add an elegant touch to any event! Weddings, parties, dinners, mitzvahs, and special occasions. Select your box from our catalog then choose a treat to put inside. Delicious Asher's Chocolates or Gummies are sure to be a hit! Whitman Pharmacy prepares trays of delicious and captivating chocolates. Including pretzels, creams, jellies and nuts - nothing is left out or forgotten under the watchful eye of our owner, Jerry Whitman. Whether you choose a tray serving 25 people (a single tier), 50 people or more, your guests will be tantalized and satisfied! All trays can be customized!